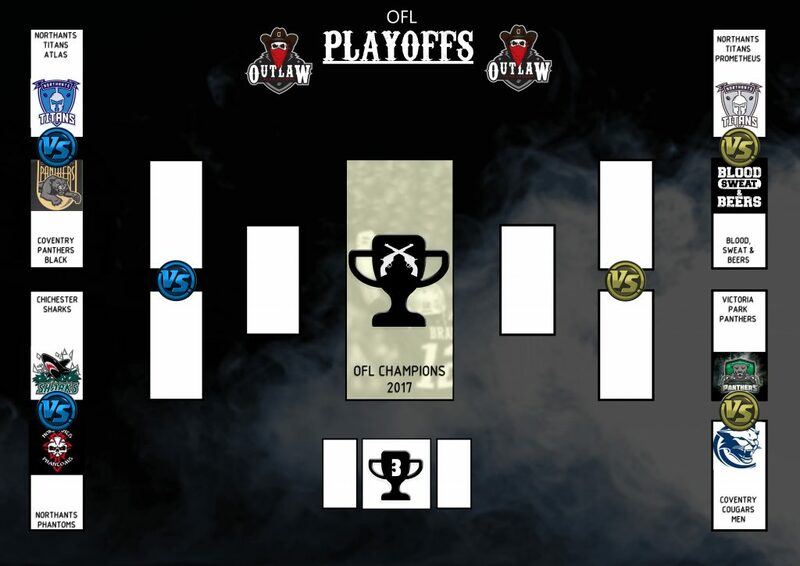 The regular season is in the books and we are a week away from Finals Day which will see 8 teams compete for the OFL Championship. 8 other teams will also compete for the inaugural Stanley Flashman Plate. 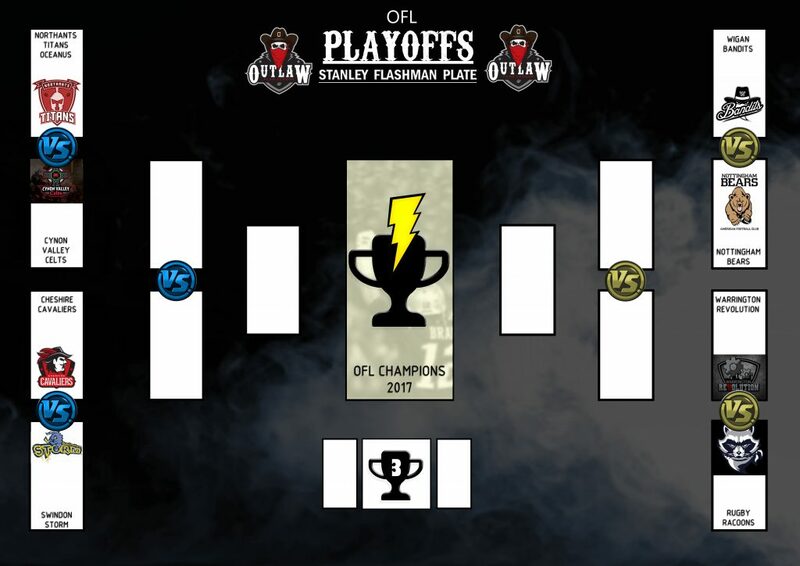 We spoke with Stanley Flashman to break down all the first round match ups that will take place at the OFL Arena on the 14th October. 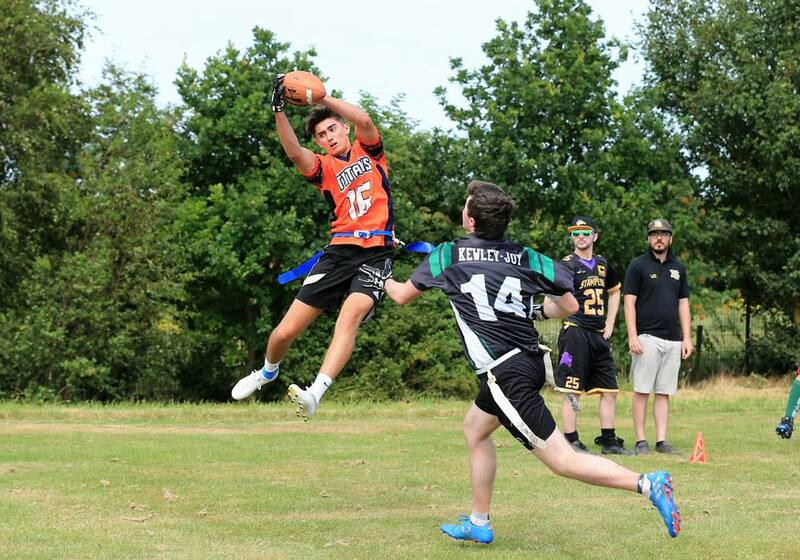 Northants Titans Atlas bounced back from a disappointing loss in the National Playoffs earlier in August 2017 by going on a hot-streak, winning their next 9 games in the Outlaw Flag League to help them secure the #1 seed from the Exile conference for the second consecutive season. 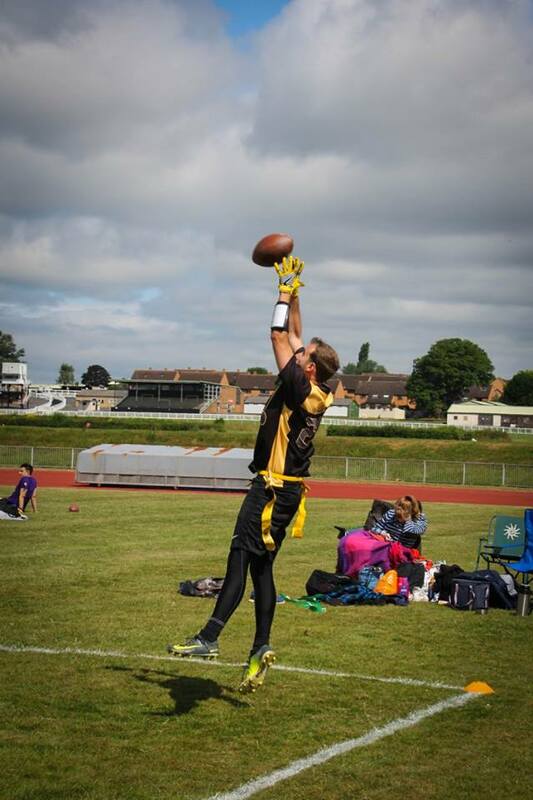 While defensive football has been a hallmark of the Titans in the BAFA leagues, their offence has also been firing on all cylinders. They looked primed for a run at the championship, provided they avoid any missteps. Coventry Panthers Black started their season in a disappointing manner with a 1-2 record. They went 2-1, then 3-0 in their following game-weeks, showing that they’ve acclimated well to the OFL format. With the 5th ranked defence in terms of PPG allowed, the Panthers Black have really shifted themselves into contenders. Their wicked blitz is a large part of why their defence has been so successful. Offensively, they have a large cast of capable receivers which James Nelms utilises well. They’re on the upswing, so they can do damage to any team they meet in the playoffs. They say defence wins championships, and both these sides will be looking to their defensive units for inspiration. I’m taking the Titans Atlas in this contest, but look to the Panthers Black to make it difficult for them throughout. The loss of Arron Timson for the day will be made up for the addition of Stefan Rowden who makes his return. 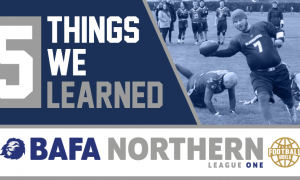 Everything went fairly to plan for the Northants Phantoms during their rookie season in the Outlaw Flag League, as the veteran BAFA side won their first 8 games on the bounce. They ran into a buzzsaw as they took on the Titans Atlas for the conference crown. They were without stalwart QB Jez Smith due to injury, and figure to be without him for the remainder of the OFL season. We’ve seen the story before in 2016 BAFA National Playoffs. They came up against the same Chichester Sharks side without Smith and suffered a heavy loss. However, that was in the past and Phantoms have grown as shown this season with the emergence of rookie Tommy Bunting on offence who has provided them with a spark alongside the veteran Anthony Muddiman. Their defence has been no joke either as the #4 ranked team in the OFL led by Dani Waples. Blitzer Pete Blundell has been a handful for teams at times this season. Jean-Pierre Lamy is looking as good as ever as a shutdown corner. 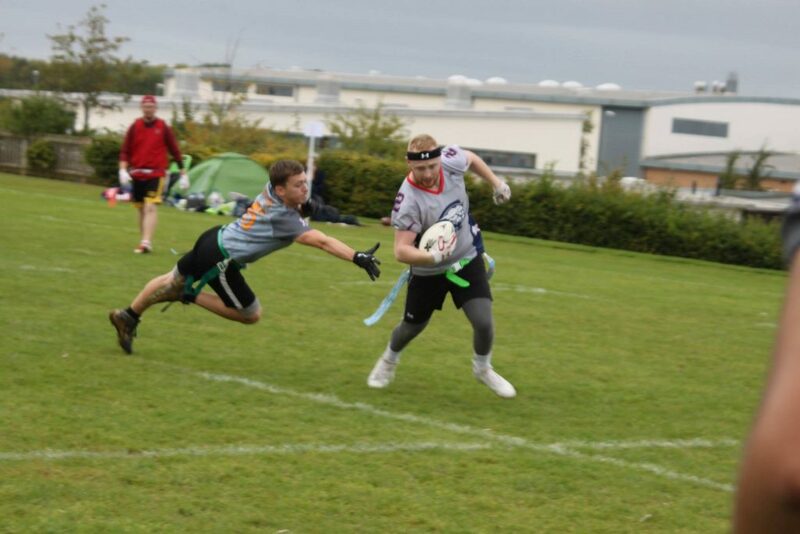 On the other hand, Chichester Sharks started their campaign without QB Neil Henderson but Corey Bedford stepped up and had an impressive day under centre, leading the Sharks to a 3-0 record., Jonathan Lupton & Kate Bruinvels stepped up on the day to give Bedford weapons to fire at all day long. The return of Neil Henderson in week 2 would give Corey Bedford a chance to show what he could do at receiver (spoiler – very well). Despite the addition of their veteran QB, they would drop their first game of the season to the plucky Titans Prometheus. The Sharks suffered another loss at the hands of the excellent Victoria Park Panthers in week three, but they would show off their offensive prowess with new additions Dan Benning & Ian Sanger. Finishing the season 7-2 gave the Sharks the third seed in the hyper competitive Bandit conference. If Jez Smith is out for this game, the Phantoms will probably have to employ either Tarry or Hoskin at QB, meaning their receiving corps will be significantly weaker. The Sharks, with Dan Benning & Corey Bedford, will probably prove too much in this match up in a close win for the Sharks who advance. 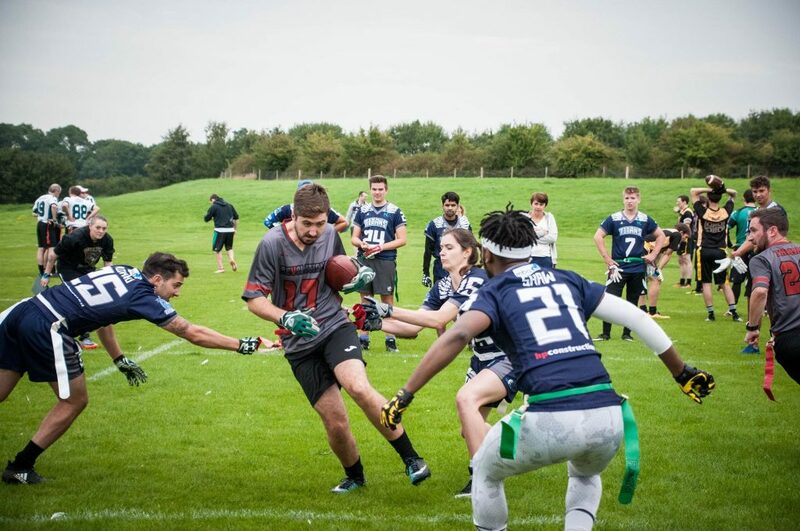 Northants Titans Prometheus will be extremely happy with how their season has gone after taking the #2 seed with an 8-1 record. 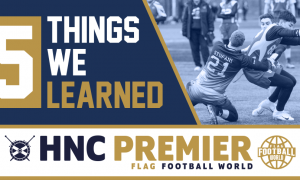 Highlights of their season included some impressive shutout wins against Coventry Panthers Yellow (75-0) & Northants Titans Oceanus (51-0) along with the victory that took them to 2nd place against the Sharks. The only disappointment on a pretty decent season was a fiery loss against the Victoria Park Panthers. 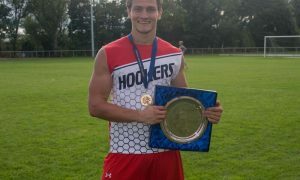 An injection of youth has helped the Titans Prometheus excel this season with National Champions Sam Tibbles, Alex Towler, Raja Sanghera & Langley Voss all contributing at some point this season. 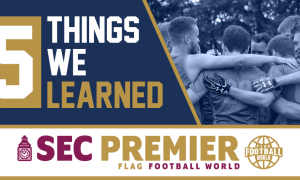 Blood, Sweat & Beers came into the Outlaw Flag League with a bang winning all three of their opening games and only conceding only 20 points and putting up 129 points. Calvin Tarlton and Bill Ammons both put in excellent showings under centre. Week 2 saw a depleted BSB side descend into the OFL Arena with only 5 players. They would stumble to an 0-2 record to start the day off with losses to the Titans Atlas and Phantoms. Their lone win on the day came against the NuOla Waves. 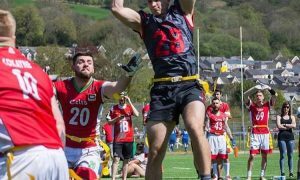 Week 3 would see the return of a more familiar BSB side, as they went 3-0 with triumphs over the Cavaliers and Celts, while they were also handed a forfeit win. The #2 ranked defence in the league will be a tough task for anyone who matches up against them with ball hawks like Drew Smith and Andrew Krag stalking on the field along with the beastly blitzing of Chad Stevens. This is paired with a bevy of almost uncoverable receivers such as Bill Ammons, Sam Hemmingsley & Joe Cotterill. This is an interesting match up for the neutral as the Blood, Sweat & Beers are a scratch team who don’t have time to practice with one another, so their timing may not be there until much later on in the game. Meanwhile the Titans Prometheus have the chemistry which has been on display throughout the season. However, with a full squad, Blood, Sweat & Beers boast the best players from two of the best teams in the nation and I think they win in a shoot out in this contest. Victoria Park Panthers finish up with a perfect season after doing it with the smallest squad in the whole tournament, making their 9-0 all the more impressive. 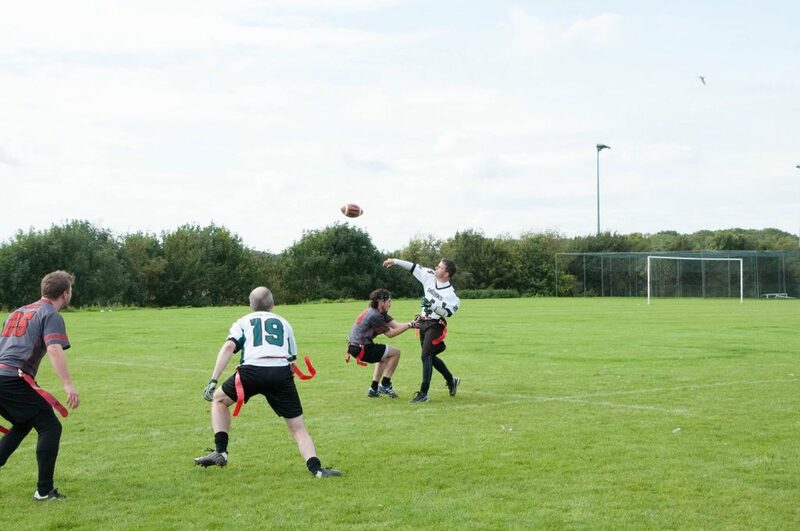 Week 1 saw them win a heated contest against the Titans Prometheus with an impressive second half from Pete Copenhall. They would edge a close contest against the Panthers Black in a 24-19 thriller, but finish the day with a 32-6 thumping of Titans Oceanus. Week 2 saw the Panthers roll the dice and allow Alan Young‘s band of Cobras to play in their place for the day. Their gamble paid off, as the Cobras went 3-0 on the Panthers’ behalf. Mantas Ceckauskas would snag 50% of the touchdowns thrown on the day by Alan Young (18 total). Week 3 followed saw some actual Panthers take the field. With their largest squad of the season so far, 6 players made the trip, including the returning Charlie Douglas and Matt Turner. Pete Copenhall continued where he left off to throw 15 more touchdowns, including his very own throw off return TD to finish the season off on a high. Coventry Cougars Men suffered some teething problems, as they tried to install a number of new recruits during their first set of games. New QB Aaron Taylor did his best, but the Cougars went winless on the field, but picked up a forfeit win. Week 2 went far better from the Cougars as they raced to a 3-0 record behind Kieran Eaton‘s excellent elusive running. 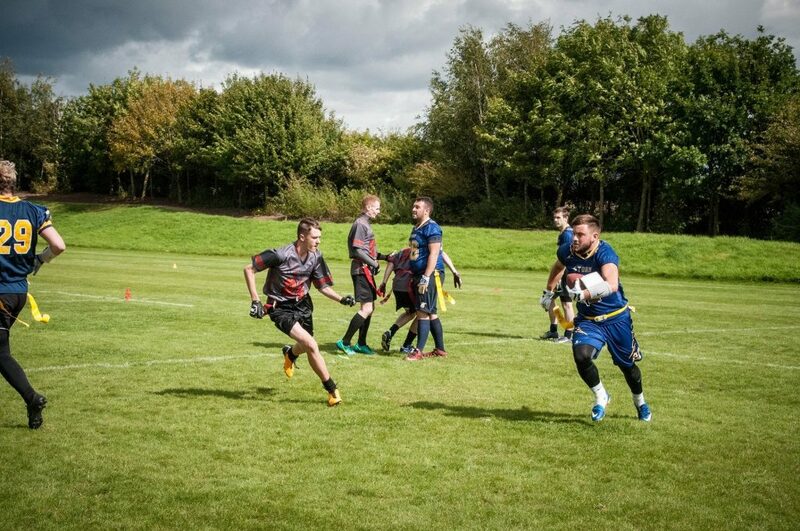 Week 3 saw the Cougars Men start off incredibly strong as they defeated the Nottingham Bears & Rugby Raccoons with relative ease but ran into a stumbling block against the Titans Atlas and failed to put any points on the board until garbage time. By this time, they’d sewn up their playoff spot, so a 2-1 record would be considered a good day at the office. Rumour has it that Victoria Park Panthers are bringing an even smaller squad to finals day but they’ve proved that with minimal players, nothing fazes them. The Cougars are likely dealing with their biggest squad to date which seems to still be working out the minor details. Arguably, the Cougars are the same as VPP, they thrive off having a smaller squad to make things click. For me, the VPP take this one and I don’t think it’ll be as close as most think with Pete Copenhall being the difference. These teams already met at NuOla Spring Break this year, with the Cougars frustrating the Panthers with their rushing offence. The Cougars picked up a comfortable victory, but things will probably be different with a more focused Panthers team coming to town. This contest will be interesting as the rookie Celts have played lights out this season so far, pushing the #2 Seed Phantoms to the final whistle in a 20-19 loss and only lost 13-6 to an experienced Cougars side. The Titans Oceanus have been a mixed bag, and it depends on who shows for them on the day. Rookie QB Adam Ribano will be hoping to bring in a full squad to compete but I think the Celts receiving corps are going to be too much for the Oceanus. Josh Evans leads arguably the best unit in this game, as the Celts defence has been excellent all year. We think the Celts win by a couple of scores. The rookie Storm have impressed at times this season picking up 3 solid wins in the process but they come up against the veteran Cavaliers. The Cavs have suffered from inconsistency this season but they have the experience to pull them through in this contest. If Storm come out and play like they’ve shown at times, they will make it difficult. The Cavs will be looking to Sergio De Paco to pull them through to the next round. The Wigan Bandits will be hoping for the return of Dino Vernazza for the playoffs who has played at a high level for the Bandits, along with players such as David McKenna, Bongo Boylan and Chris Cook. They come up against the Nottingham Bears who have only won once in the OFL this season in a nail biter against the Rugby Raccoons, the other a forfeit win on the final day which put them into the playoffs. They will be looking to Alex Kusmirek who’s been the main threat for the Bears this season. We’re giving the advantage to the Bandits, who are just coming off a plate victory at the NuOla Indian Summer tournament. Warrington come into this contest disappointed that they didn’t make the main playoffs but have shown that they will be a force for years to come in the OFL. They’ve had to play three different QBs in three weeks. An excellent 5 wins for the Revolution put them high in the seedings for the plate tournament. On the other side of this match up, they face the Rugby Raccoons who have yet to register a win in this years competition on the field. They’ve earned their place in the plate bracket by virtue of their two forfeit victories, but as they say, your best ability is your availability, and the Raccoons have persevered throughout the season. We reckon the Revolution win this game by a couple of scores, but the Raccoons have some interesting players who could make this a closer tie than expected.